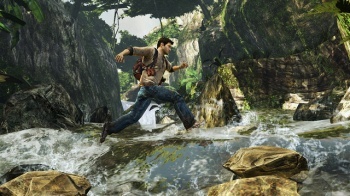 Uncharted for the PS Vita is nearly indistinguishable from the PS3 version. Uncharted: Golden Abyss for the PS Vita might look like the original Uncharted for PS3 because of the jungle level currently being shown off, but it's not. The game isn't even associated with the title other than through its main star and does not lead into the beginning of the Uncharted series. Golden Abyss takes place during one of Nathan Drake's escapades that occurred before Uncharted began, so it's a brand new story. The demo being shown off at E3 focused on the introduction of Jason Dante, a friend and associate with which Drake engages in witty banter as he leads Drake through the jungle on a hunt for hidden treasure. Seeing Golden Abyss in trailer or video form doesn't compare to looking at it on the Vita's surprisingly large screen in person. The game is absolutely gorgeous, and though you can tell at certain moments that it doesn't have the super-high detail level of the PS3 version, it's amazing that a game of this caliber is now being delivered on a handheld. The cutscenes with Dante and Drake feature the same quality of animation that we already know from the Uncharted series. The Uncharted style is also wholly present in Golden Abyss' gameplay, but it takes advantage of being on a handheld that features a multi-touch OLED touchscreen, gyroscope, and rear touchscreen. As an Uncharted fan, the Vita's button and dual-analog stick layout allowed me to jump right into the game without re-learning any controls, hopping up ledges, rolling, and jumping across chasms. All of this is the same. However, Golden Abyss also provides a full range of optional (notice I said optional) controls using the Vita's features. Let's say you walk up to a ledge. Just tap the ledge to climb up. Let's say you fall through the planks on a wooden bridge and are hanging on for dear life. Just swipe up on the screen to prevent your fall. It's much more intuitive than pressing a button. In addition, players can swipe across sections of rocky outcroppings to have Drake climb his across them automatically, which might sound cheap, but you're still creating Drake's path so I don't see a problem with it. During my demo, the touchscreen was also used to create rubbings of the ruins and to then assemble them like a puzzle, something new for the series. Another new addition that takes advantage of the Vita's gyroscope is a camera mini-game where players have to snap a photo of a location that is as similar as possible to one shown in black-and-white, with the game giving a percentage ranking. You literally move the Vita around the real world like it's a camera to align your shot. These aspects all use the Vita's features extremely well, but others are a bit more uncomfortable. I didn't really get the hang of using the gyroscope to swing as I hung onto a rope. Climbing up a vine by rubbing on the rear touchscreen didn't work perfectly for me either. Chalk it up to human error if you will. Thankfully, if you have the same trouble, I'll reiterate that Golden Abyss' Vita-exclusive control methods are totally optional. Unfortunately, I didn't get to experience any gunplay, a major component of the Uncharted series. The focus of the E3 demo was mostly Drake's non-combative actions. If battle matches up to everything else I've seen so far, Uncharted fans are going to want a PS Vita when it launches in late 2011.